2017, c'est parti ! - Association l'Atelier vert : Education à l'environnement et initiatives nature en Lorraine ! Ce petit mot pour vous souhaiter à tous le meilleur pour cette année à venir. De notre coté déjà beaucoup de projets et d'envie dans les valises, qu'on espère partager avec vous. 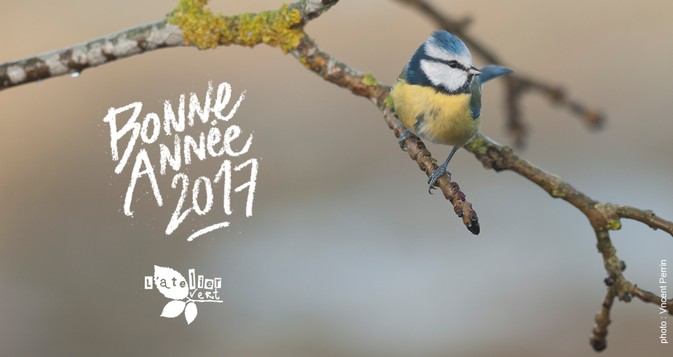 On en profite pour vous inviter à prendre vos adhésions 2017, afin de soutenir l'association bien sûr, mais aussi de participer à toutes nos activités : un calendrier encore bien rempli qui arrive ces jours-ci, ainsi que pas mal de nouvelles ! Hurrah! At last I got a website from where I can truly take helpful facts regarding my study and knowledge. Marvelous, what a webpage it is! This website provides valuable data to us, keep it up. Aw, this was a very good post. Taking the time and actual effort to generate a very good article� but what can I say� I put things off a lot and don't manage to get anything done. It's very effortless to find out any matter on web as compared to textbooks, as I found this paragraph at this web page. Does your site have a contact page? I'm having trouble locating it but, I'd like to shoot you an email. I've got some suggestions for your blog you might be interested in hearing. Either way, great blog and I look forward to seeing it develop over time. Hello Dear, are you in fact visiting this web page daily, if so after that you will definitely take good experience. Wow that was strange. I just wrote an very long comment but after I clicked submit my comment didn't show up. Grrrr... well I'm not writing all that over again. Anyway, just wanted to say wonderful blog!